Crops such as wheat and maize have undergone a breeding process lasting thousands of years, in the course of which mankind has gradually modified the properties of wild plants into highly cultivated variants. One motive was higher yields. A side effect of this breeding has been a reduction in genetic diversity and the loss of useful properties. This is demonstrated by an increased susceptibility to diseases, a lack of flavor or reduced vitamin and nutrient content in modern varieties. Now, for the first time, researchers from Brazil, the U.S. and Germany have created a new crop from a wild plant within a single generation using CRISPR-Cas9, a modern genome editing process. Starting with a wild tomato, they introduced a variety of crop features without losing the valuable genetic properties of the wild plant. The results have been published in the current issue of Nature Biotechnology. "This new method allows us to start from scratch and begin a new domestication process all over again," says biologist Prof. Jörg Kudla from the University of Münster (Germany), whose team is involved in the study. "In doing so, we can use all the knowledge on plant genetics and plant domestication that researchers have accumulated in recent decades. We can preserve the genetic potential and the particularly valuable properties of wild plants and, at the same time, produce the desired features of modern crops in a very short time." Altogether, the researchers spent about three years working on their studies. As the parent plant species, the researchers chose Solanum pimpinellifolium, a wild tomato relative from South America, and the progenitor of the modern cultivated tomato. The wild plant's fruits are only the size of peas and the yield is low—two properties that make it unsuitable as a crop. 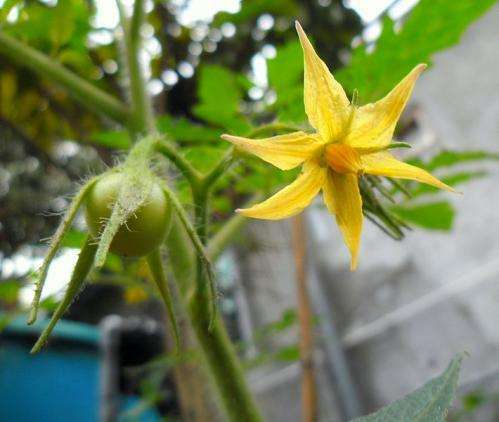 On the other hand, the fruit is more aromatic than modern tomatoes, which have lost some of their taste due to breeding. Moreover, the wild fruit contains more lycopene. This so-called radical scavenger is considered to be a valuable antioxidant. The researchers modified the wild plant by using multiplex CRISPR-Cas9 in such a way that the offspring plants bore small genetic modifications in six genes. These decisive genes are considered to be the genetic key to features in the domesticated tomato. Specifically, the researchers produced the following modifications to the wild tomato genome: the modified fruit is three times larger than the wild tomato, which corresponds to the size of a cherry tomato. Plants produce 10 times the number of fruits, and their shape is more oval than the round wild fruit. This property is popular because, when it rains, round fruits split open faster than oval fruits. The plants also have a more compact growth. Another important new property is that the lycopene content in the new breed of tomato is more than twice as high as in the wild parent—and no less than five times higher than in conventional cherry tomatoes. "This is a decisive innovation that cannot be achieved by any conventional breeding process with currently cultivated tomatoes," says Jörg Kudla. "Lycopene can help to prevent cancer and cardiovascular diseases. So from a health point of view, the tomato we have created probably has an additional value in comparison with conventional cultivated tomatoes and other vegetables, which only contain lycopene in very limited quantities." So far, he adds, breeders have tried in vain to increase the lycopene content in cultivated tomatoes. In cases in which they were successful, however, this was at the expense of the beta-carotene content, which also protects cells and is therefore a valuable nutrient. Jörg Kudla sums up the dilemma of modern agriculture: "Our modern crops are the result of breeding—with all its advantages and disadvantages. A lot of properties, such as resilience, have been lost, and we would only be able to regain them through a laborious, decades-long process of backcrossing with the wild plant—if at all. The reason is that properties that are the result of the interplay between numerous genes cannot be restored through traditional breeding processes. In many aspects, domestication is like a one-way street. With the help of modern genome editing, we can use the advantages of the wild plant and solve this breeding problem. In brief, molecular 'de novo domestication' offers enormous potential—also for producing new, desirable properties." Moreover, adds Prof. Kudla, it will now be possible to take healthy plants that have not so far been used by humans, and by means of a targeted increase in the size of their fruit or by improving other features of domestication, transform them into entirely new crops. The researchers used the CRISPR-Cas9 method to target and deactivate genes in the Solanum pimpinellifolium plant by means of so-called loss-of-function mutations. From among the plants thus genetically modified, they selected suitable mature parent plants. The researchers examined the offspring of these parent plants for their external visible features and analysed their properties.